There are many videos online that either don’t have captions or have auto captions. Auto captions are not of acceptable quality. Bad captions are not better than no captions. Machine generated captions fail to meet many good quality captioning guidelines. It’s like reading a book that is not edited and includes a lot of grammatical mistakes – which makes it hard to enjoy the book. Low quality captions are like a poorly written book. YouTube captioning tool itself is not a problem if it’s used the right way. Sadly, many people don’t realize that it’s a responsibility of media owners and producers to make their videos accessible and to ensure that their captions are of acceptable quality. They blame bad captions on YouTube, not the lack of responsibility of video owners and producers. 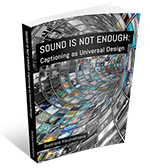 Many also don’t know how to create good quality captions in their videos or how to download a .srt caption file that can be uploaded to Vimeo, Facebook, and other video platforms with a captioning feature. Click the photo above to watch my video with captions (you can turn on English captions in video settings) discussing how to add good quality captions in YouTube, how to download a .srt caption file, how to upload them to Vimeo and Facebook. Below is a full text transcript. To let you know, the sample video that I uploaded to YouTube for some reasons didn’t produce auto captions. It depends on how well machine can understand voices – it probably didn’t understand mine, haha. So I showed how to type in text or copy and paste text to create captions. You can clean up auto captions in the similar way – by fixing text, adding proper punctuation, speaker identifications, sound descriptions, etc. and by fixing timing (auto timing doesn’t chunk captions well). You can also check out my TEDx talk video about how high quality captions increases audience and ROI for businesses. “Hello! My name is Sveta, I’m a founder of Audio Accessibility. I would like to discuss how to add captions to online videos and why all videos need to be captioned on all platforms like YouTube, Facebook, Twitter, Vimeo, etc. 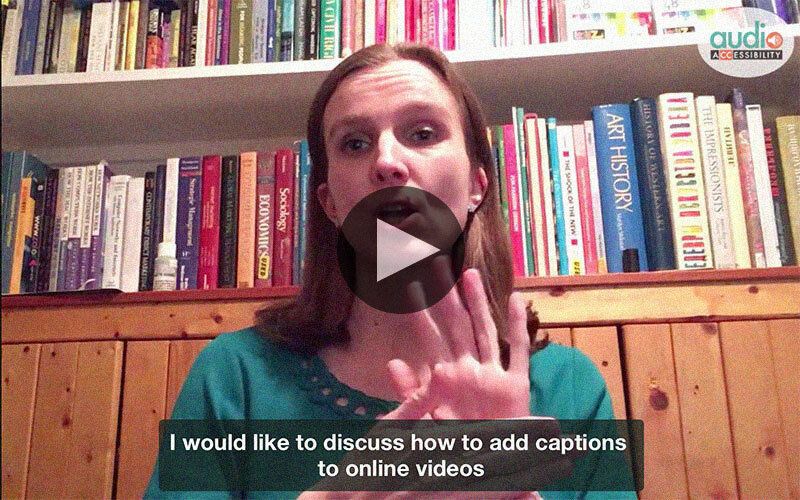 Also, captions need to be prepared before sharing videos publicly so that everyone can enjoy them. Many think that just turning on auto captions in YouTube would solve all accessibility problems.. No.. That’s not true.. Auto captions are NOT of acceptable quality. Bad captions are NOT better than no captions. That’s why many deaf people call them cRaptions. While YouTube offers a great tool that makes it easier for video producers to add captions to videos, in no way that feature is meant to allow machine auto generate captions because the machine cannot follow many quality captioning guidelines. Captions are more than just adding words. That’s why you need to add captions manually – either by cleaning up auto captions or by creating captions from scratch. For professional videos it’s advised to hire a professional captioner who is familiar with quality captioning guidelines. I will discuss soon how to add captions in YouTube – but it is not that hard to do it yourself. Another great thing about YouTube is that after you are done with adding captions, chunking them, and synching them with audio, you can download a caption file that you created yourself with help of YouTube. That caption file can be uploaded to any video platform that supports captioning – like Vimeo, Facebook. As of now, Twitter doesn’t offer captioning support for their videos, so I would suggest that you share a video [in Twitter] by posting a link to YouTube, Facebook, Vimeo – or any other video that have built-in captioning support. In addition to video captions, I would also suggest that you add a full text transcript with visual description for those who cannot see. Transcripts are only complementary to video captions but are not meant to replace them. auto captions, captioning, captions, craptions, deaf, Facebook, hard of hearing, social media, subtitles, twitter, user experience, ux, video, vimeo, youtube. Do you have questions or need customized solutions? How to Make Your Events Accessible for Deaf and Hard of Hearing Attendees Are Speech Technologies and AI Replacements to Human Captioners?